One of the things we have enjoyed on this trip has been the interesting people we have crossed paths with. Sometimes it is a worker at an attraction that asks where we are "from” and then tells us where they are "from” and what brought them "west” when we probe a little. It is a Bingo game of greater proportions than connecting on one’s ethnic background. What also has impressed me is how the youth of today have embraced the opportunities found "out west”. Of course some came west for the oil boom and are now displaced, working in other occupations, not bemoaning their change in fortune. Some were our tour guides who are students or have started careers in totally different areas than where they are working for this summer. It is always interesting to get a little background on the people we meet along the way. Travelling by RV invites another interaction, from the "where are you from” to "where is Home in Ontario” when they notice our Ontario license plate. You see many States and Provinces in the license tags and walking a dog in a campground always bring you into contact with people. Some travel in trailers of all sizes from small ones smaller than a compact car (in all dimensions), to pop-up trailers to the largest fifth wheel trailers hauled behind some very large trucks. We’ve seen Smart cars on platforms behind the cab of over-the-road transport truck cabs and hauling large fifth wheel trailers behind that. Some have living accommodations at the front of a horse trailer, traveling with their horses. 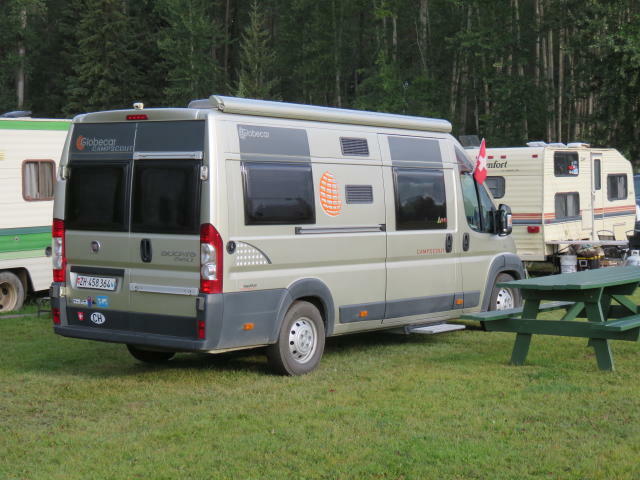 On the motorized side we have seen small Class B van style motorhomes to full sized, bus type RV’s and everything in between. Some RVs are close to fifty years old and some are brand new. Then there are literally hundreds of pickup style campers that are placed in the back of conventional pickup trucks. Many of the smaller RVs and these pickup campers are rented from companies that specialize in renting RVs for just such trips. Of course we cannot ignore the many motorcycles travelling singly or in groups. Some carry the basics with them, some have tow behind motorcycle trailers. It is also common to pass bicycle travellers biking along the road, also carrying the basics (and more) with them. How they endure the hill climbing is beyond us. The last group of travellers are those that we meet along the road or at campsites are the individuals who have packed their car, van or truck with the basics, (some very uniquely) and are on an adventure vacation. All meet along the road enjoying the trip just as we do. Then add to this eclectic group those who are enjoying an Alaskan Cruise, a Rail or Bus tour and those who planned their own fly-drive vacation. Again the surprise here was the number of young people who are on these adventures. One young couple we met on the Fjord tour were from the Chicago area and were each Target store managers. We had a great day together and they shared that they had ‘always’ wondered about Alaska and wanted to see Denali, so they decided to just do it! Roughly half our age and totally enjoying a busy vacation. Go for it! Most RVers think of their RVs (trailers and motorized) as a second home or a home on wheels, characterized by the saying "home is where I’m parked” which often is displayed on a placard mounted where the front license plate would be. We’ve seen that term and this concept taken to a totally different level on this trip by people who are travelling from Europe. Some have rented a RV and are exploring as we are. Some planned to go to Inuvik, Northwest Territories, some to Deadhorse, Alaska (both on the Bering Sea) some then flying to Barrow, Alaska, the northernmost point of land in the USA. 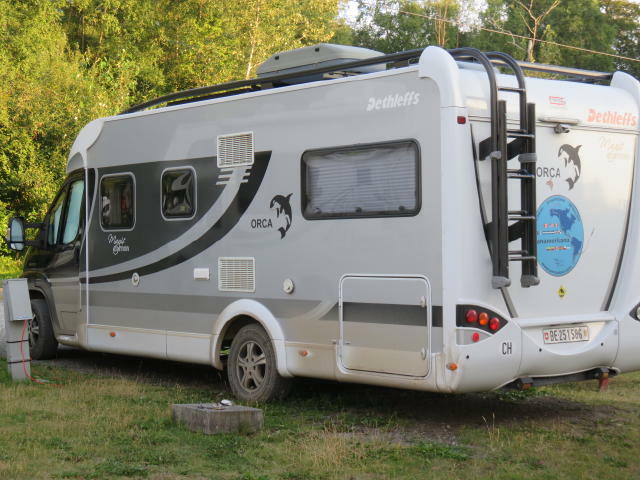 We have actually met and had some of these travellers in our RV, since they are amazed at the size of it, compared to the ones they own in Europe. We’ve stopped at rest areas along our trip and had our RV be the focus of attention, rather than the scenery at that spot. The last group are those Europeans RVers who have actually shipped their RV across the ocean to the US or Canada (or South America!) and are travelling in their own RV (home) throughout the trip. I have always admired how the RV industry builds to the needs of the local market, so to see these RVs up close is something unusual for me. I’ve have taken a few pictures of these along our travels and this set of slides shows the diversity of the styles. We did not go inside any of these however, having been inside others in the past, I can say they are very efficient, not only in interior space utility, but also in fuel efficiency. Most are equipped with manual transmissions and either a four or six cylinder (often diesel) engine. Some a built on a Mercedes Benz chassis, others on a Fiat or Renault one. 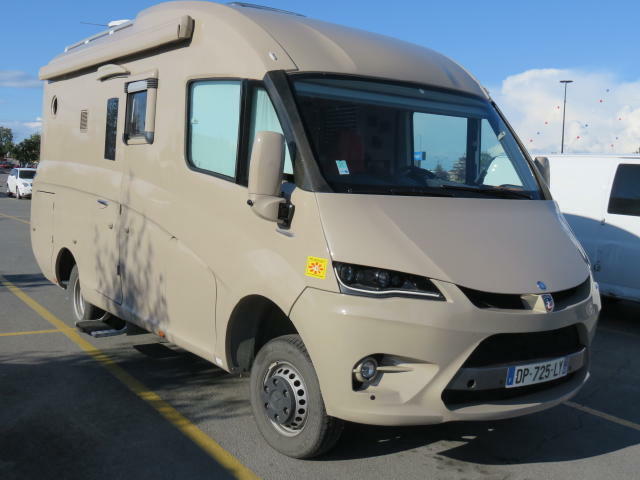 These chassis are now being imported to North America where RV makers are just starting to produce RVs on them (all with Automatic transmissions). Slide 1 shows a short truck style that is very tall relative to its length. The side door is accessed by steps on the lower body or by the ramps attached on the rear exterior wall. These also double as traction plates for off road locations when the four wheel drive needs a little assistance to grip the terrain. The roof is designed to be a cargo area as well as the area over the front cab. It looks like a military vehicle on first glance. Slides 2 and 3 shows a another one which has a similar appearance however the upper section is raised up for living use, and lowered while driving. The interior can be accessed in both positions. Note the two spare tires they carry and the numerous orange hub bolts on the wheels. These are very heavy duty vehicles designed to go anywhere. This one has a winch similar to what is found on some Jeeps in North America, so that it can be winched out, should it get stuck. Note the tortoise symbol on the upper section with a stylized globe. It truly can go anywhere, slowly but surely. The fourth Slide is a close up of a graphic of the trip that the vehicle (and its owner) are on. Slide 5 shows the means of travel. The graphic says it all! Look at it and study it carefully. We met them in Anchorage. Talk about a trip of a lifetime! Slides 6 and 7 show a luxury German RV that we saw in Anchorage on our return trip. Contrast it to the first few and you can see a dramatic difference with form taking priority over function. That is not to say that functionality is not there, however this RV is designed for travel more like what we experience in North America. It is a sleek body style with LED lighting everywhere, a high mounted, covered spare tire and enclosed storage areas. This one is built on a Mercedes Benz chassis. 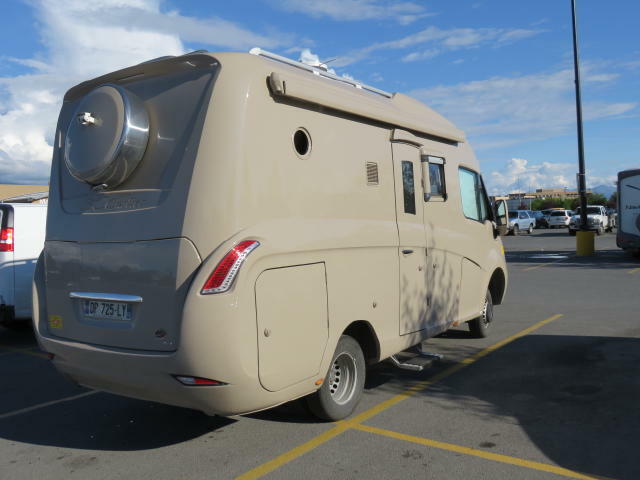 We also saw less luxurious versions of these RVs that are very similar to the designs that are now popular in North America, which frankly, are mimicking these truly European models. 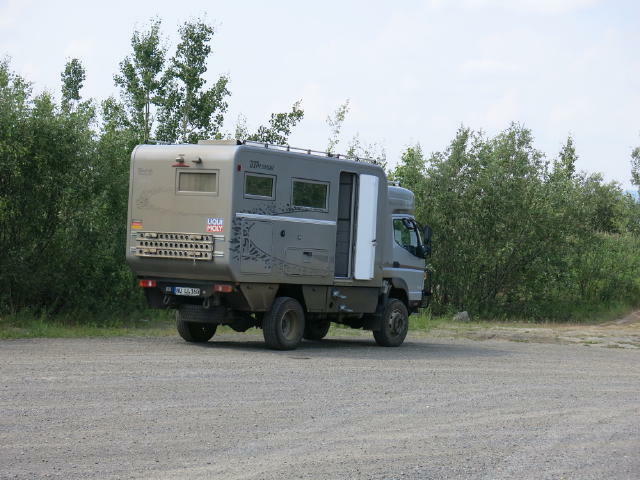 The Mercedes Benz and Fiat chassis on which many of the European RVs are based are now being imported to this side of the Atlantic and with the globalization of the automobile industry some the platforms popular in Europe are now being assembled in North America. 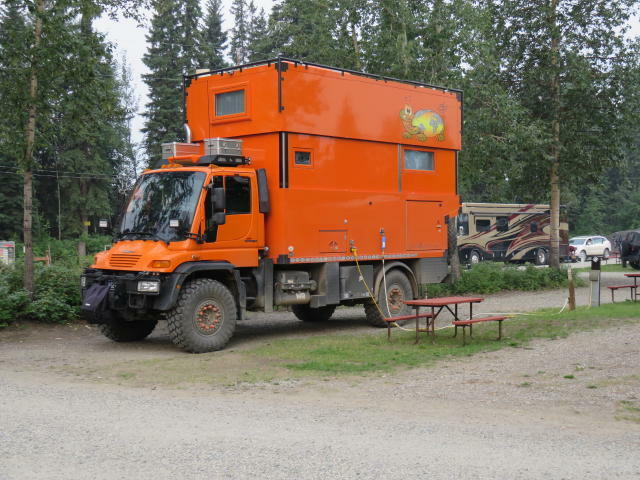 Slide 8 is a truck camper that is permanently mounted on a smaller pickup chassis. Note the tubing coming from the engine area on the right front side (left side in photo) which allows the engine intake air to be drawn in while driving in water! Again some interesting design features together with functionality. 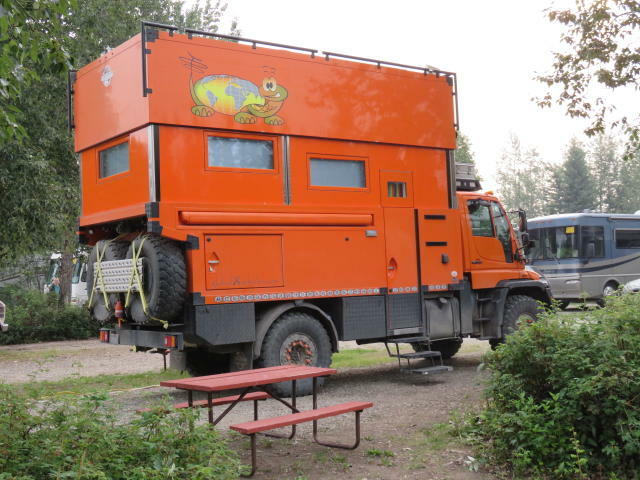 Not a very "pretty” vehicle but I am sure it serves the owner/traveller very well. Slides 9 and 10 show a van style Class B van much closer in styling to those now becoming popular in North America. 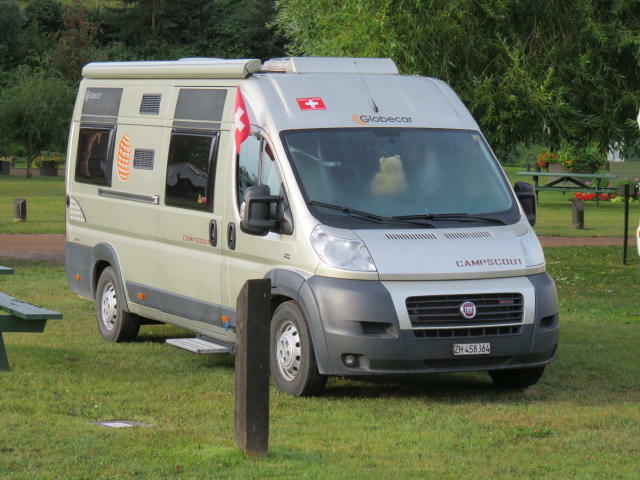 This one is built on a Fiat Ducato chassis where function and style co-exist in a nice compact vehicle. You will notice the Swiss flag prominently displayed in Slide 10. We noticed that both on the owned vehicles and many rental ones, the flag of the occupant’s country was displayed either flying or easily visible from the outside through a window. 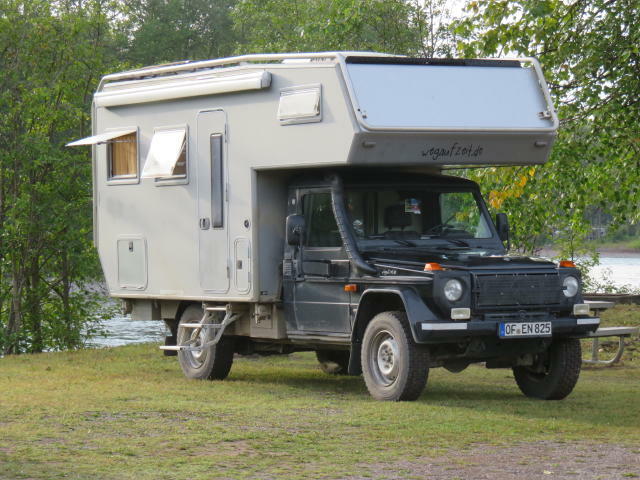 Some would say that with the fuel economy and emission standards now being implemented, that RVs are going to be more like these modern stylish European styles. While there will be a large number of these produced and sold, one common thread expressed by those travelling in them is that North America is Huge! 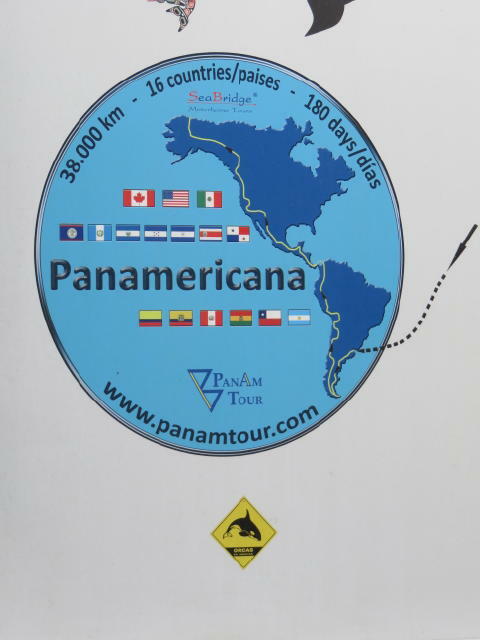 Travelling longer distances that are only dreamed of in Europe is common and for those that brought their Euro RV with them, they now know how vast the North American (and in one case, the South American) Continent(s) truly is/are. Everyone we talked to, were glad to have had the experience of travel on this side of the ocean and we all have memories of a lifetime, each from our own unique perspective. We hope you enjoy this overview.